(Mpr & Shuzzr Consulting) - Rising artist "Spontaneous" has released "Pree Dem A Pree Mi" video featuring Drezion, it is the debut single from his upcoming "Mus Bus" EP which will be distributed by 21st Hapilos Digital. The single is a Tenament Yard/Quick Mixx music production and the video was directed by Kemstyle Studios. The idea for the song came from Spontaneous rising status in the entertainment industry since Magnum Kings & Queens and Rising Star Competition. While working in the studio, Spontaneous lamented to Drezion on the unfortunate circumstances where friends became foes and his every actions became monitored. 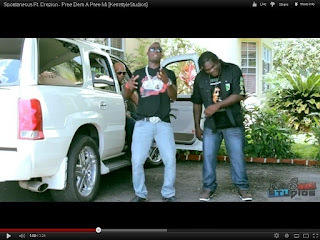 Drezion stated to him "Pree Dem A Pree" and from there the song was born. "Pree dem a pree mi tru mi links dem tun up a road, Pree dem a pree mi tru mi step up in a life and crush dem out like a toad" sings Drezion. The rising artist recognizes that on his musical road there will be deterrents but his faith in God and family keeps him grounded "Giving thanks and praise to the Most High" says Spontaneous. He is fortunate to be mentored by a man who wears many hats, the Tenament Yard Records CEO/Producer and artist "Drezion" and his manager "Quick Mixx". Born in the rural part of Clarendon – the talented spontaneous was born to sing. From an early age he was a free spirited person who was immersed in his art. Always reeling tunes on the spur-of-the-moment off the top of his head and the tip of his tongue. Spontaneous’ family moved to Kingston in an effort to make life better for the family. Living with relatives and going to school . This youngster never lost his passion for music as he continues streaming rhythmic tunes. Training for a heavy duty general license he went on to work with an established Jamaican firm. Spontaneous became affectionately known as DJ in his work circles – as that was what he did all the time keeping other people’s spirits up while “trodding” along. Obviously talented at penning and naturally free styling lyrics . Spontaneous would do the odd show and jobs which presented opportunities to him. He entered the Rising Star Competition and Magnum Kings & Queens he also collaborated in 2003 with US artiste King Elements on a Sonic Sounds video called Boody Roll. Spontaneous now moves on to the renaissance of his career. He is signed to Quickmixx Music/Tenament Yard –He is matching the best and exceeding the rest – Giving thanks and praise to the Most High. MC Spontaneous – Lyrics Naturally! Tenament Yard Records is the brainchild of the creative genius Andre 'Drezion' Bailey. Drezion made his debut on the music scene as a rhythm composer. He has contributed to the albums and singles of international chart toppers such as Rihanna, Lil Wayne, India Arie and many others. He has been responsible for the composing of a number of dancehall rhythms such as 'Resident Evi'l and 'Slaughter House'. Drezion aka Andre Bailey (b. November 15, 1985) hails from Kingston, Jamaica. As a youth he was introduced into the world of music by being exposed to a variety of instruments in church. It was evident that music came naturally to Drezion, as he could instantly learn and repeat any piece of music presented to him. Learning by ear enabled him to be proficient on a variety instruments beginning with drums, guitar, bass and finally finding his true calling on keyboards. Throughout his academic career he won trophys at JCDC and was a top student at Enda Manley College, which he attended until 2007. During college, Drezion was introduced to Anchor Records and began working closely with Gussie Clarke in a studio setting. This was a turning point in Drezion’s budding career as a professional musician, as he also found a passion for making beats. This natural talent grew and therefore drew attention from Father Romie of Exodus Studio/Soundstyem and Vybz Kartel, making him the first producer for Portmore Empire. The collaboration produced beats like “Skin Will Burn”, “First Chapter” and “Evil Deeds”. Before he even finished college, he was pursued by Morgan Heritage to play keyboards with them. For five years, Drezion toured and recorded with Morgan Heritage and is now the Musical Director for their solo projects.